The Middle Spotted Woodpecker (Dendrocopos medius) is a European woodpecker belonging to the genus Dendrocopos. 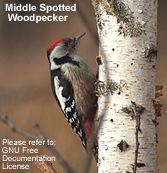 The Middle Spotted Woodpecker is 20-22 cm long and has plumage similar to the Great Spotted Woodpecker. As with that species the upperparts are predominantly black with white oval wing patches and white barring on the wings, and the underparts are white. The main differences are a red crown, lack of a black moustachial stripe, a pink vent, and dark streaks on the flanks. Although only slightly smaller than the Great Spotted Woodpecker, it appears smaller due to its short, slender bill and more rounded, pale head. It can also be confused with the Syrian Woodpecker (particularly juveniles), being told from this by the smaller bill, and the red crown not having narrow black sides. The Middle Spotted Woodpecker occurs only in Europe and southwest Asia, from northern Spain and France east to Poland and Ukraine, and south to central Italy (where local), the Balkan Peninsula, Turkey and the Caucasus. Due to its sedentary nature it has never been recorded in Great Britain. It prefers deciduous forest regions, especially areas with old oak, hornbeam and elm, and a patchwork of clearings, pasture and dense woodland. In the breeding season it excavates a nest hole about 5cm wide in a decaying tree trunk or thick branch. It lays four to seven eggs and incubates for 11-14 days. Behaviourally it likes to feed high in the trees, moving constantly and making a good view difficult.The Middle Spotted Woodpecker lives predominantly on insects as well as their larvae, which it finds by picking them from branches and twigs rather than hacking them from beneath the bark. It will also feed on tree sap. It is rarely heard drumming, and never for territorial purposes, which it asserts by song; a slow,nasal gvayk gvayk gvayk gvayk gvayk. Calls include a fast kik kekekekek.